Here are photos of some of our employees eagerly waiting to provide you with our quality services. Timothy and April PeckCo-Owner Timothy Peck began his towing career at Jim’s Towing in 1986. His is proud to not only be a level 6/7 WreckMaster, but also a 2008 Top Ten WreckMaster and most recently the 2014 WreckMaster of the Year. With over 30 years in experience Tim has the knowledge and resources available to make any Towing, Recovery, or Transport job a success. Co-Owner April Peck began her automotive related career while still in High School, working at a local auto repair shop part time. She is the person behind the organized chaos of the business and prefers to interact with all of her customers directly by not utilizing an answering service-but by answering the phones directly 24/7/365 days per year. April is also responsible for almost all of the office clerical duties and dispatching. Don’t be fooled though-she can, and will get out and tow if needed! 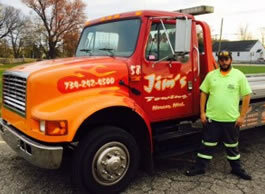 Co-Owner Timothy Peck began his towing career at Jim’s Towing in 1986. Hi is proud to not only be a level 6/7 WreckMaster, but also a 2008 Top Ten WreckMaster and most recently awarded the 2014 WreckMaster of the Year. With over 30 years of experience Tim has the knowledge and resources available to make any Towing, Recovery, or Transport job a success. Co-Owner April Peck began her automotive related career while still in high school, working part time at a local auto repair shop part time. She is the person behind the organized chaos of the business and prefers to interact with all of her customers directly by not utilizing an answering service-but by answering the phones directly 24/7/365 days per year. April is also responsible for almost all of the office clerical duties and dispatching. Don’t be fooled though-she can, and will get out and tow if needed! David “Roscoe” Neckel is hands down one of the best carrier operators in the industry today. Roscoe is also a level 6/7 WreckMaster, starting his career in 2004. He is our Go-To man when the exotic car transport job or any other challenging job comes up! David “Roscoe” NeckelDavid “Roscoe” Neckel is hands down one of the best carrier operators in the industry today. Roscoe is also a level 6/7 WreckMaster, starting his career in 2004. He is our Go-To man when the exotic car transport job or any other challenging job comes up! 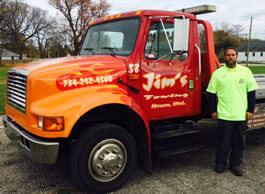 Kenn Ford started his Towing & Recovery career in 1998 at Jim’s Towing. Kenn is a very well-rounded operator, specializing in Tow Truck Towing and Recovery, however he does also do great work for us in our carrier and transport division when needed, and is being trained in our Heavy Duty operations. Also Kenn is a level 6/7 WreckMaster, Kenn has the experience and training to make even the difficult jobs look easy. Kenn Ford Kenn Ford started his Towing & Recovery career in 1998 at Jim’s Towing. Kenn is a very well-rounded operator, specializing in Tow Truck Towing and Recovery, however he does also do great work for us in our carrier and transport division when needed, and is being trained in our Heavy Duty operations. Also Kenn is a level 6/7 WreckMaster, Kenn has the experience and training to make even the difficult jobs look easy. Jeffrey Whiting is our general shop “Gopher” his duties include cleaning the shop, running for parts, outside grounds maintenance, and our all-around helper with whatever we need done. Jeffrey WhitingJeffrey Whiting is our general shop “Gopher” his duties include cleaning the shop, running for parts, outside grounds maintenance, and just all around helper is what we need. Forrest Peck is our youngest operator, but don’t let his age deceive you! He has been around the Towing Industry all of his life. 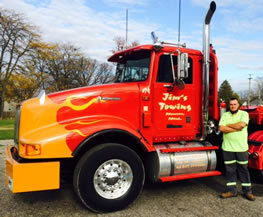 Forrest is a Level 6/7 WreckMaster and is extremely will versed in all aspects of the business – Light, Medium, and Heavy Duty. Forrest PeckForrest Peck is our youngest operator, but don’t let his age deceive you! He has been around the Towing Industry all of his life. Forrest is a Level 6/7 WreckMaster and is extremely will versed in all aspects of the business – Light, Medium, and Heavy Duty. Corey Stein is our newest carrier operator and is currently finishing up with our extensive training program. Corey is scheduled to begin working on his own soon and we have no doubt he will be successful! Corey Stein is our newest carrier operator an is currently finishing up with our extensive training program. Corey is schedules to begin working on his own soon and we have no doubts he will be successful! Although Josh Gillenkirk is relatively new to the Towing and Recovery field, starting in 2015, he has been around automotive related businesses since childhood. 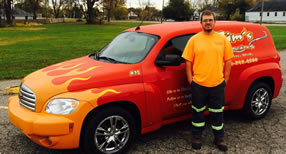 Josh was employed in our shop-and expressed interest in moving over to the Towing side. He is a certified level 4/5 WreckMaster and is showing great progress! Josh GillenkirkAlthough Josh Gillenkirk is relatively new to the Towing and Recovery field, starting in 2015, he has been around automotive related businesses since childhood. John was employed in our shop-and expressed interest in moving over to the Towing side. His is a certified level 4/5 WreckMaster and is showing great progress! Garland Coleman began his career in the Towing Industry in 2011. His current duties are primarily operating a carrier – however he is also being trained in our Heavy Duty operations. Garland is also a level 6/7 Certified WreckMaster. Garland ColemanGarland Coleman began his career in the Towing Industry in 2011. His current duties are primarily operating a carrier – however he is also being trained in our Heavy Duty operations. Garland is also a level 6/7 Certified WreckMaster. 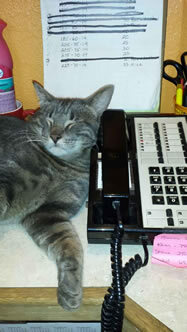 Gary (the cat) – our highly trained operator – is eagerly waiting to take your call! Gary (the cat)Gary (the cat) – our highly trained operator – is eagerly waiting to take your call! Fredrick T. McMurray IV is in charge of security details , leftover food investigations, and tire cleanliness. 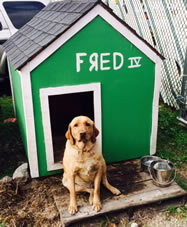 Fredrick T. McMurray IVFredrick T. McMurry IV is in charge of security details , leftover food investigations, and tire cleanliness.